Find out whenever a downloadable new crochet pattern by Doris Chan or by Vashti Braha is added to the DesigningVashti Shop. Doris Chan has granted us an exclusive to carry her DJC indie pattern line in the shop! CGOA member Irene Iannelli brings her photography-savvy husband, Alex, to Chain Link conferences. 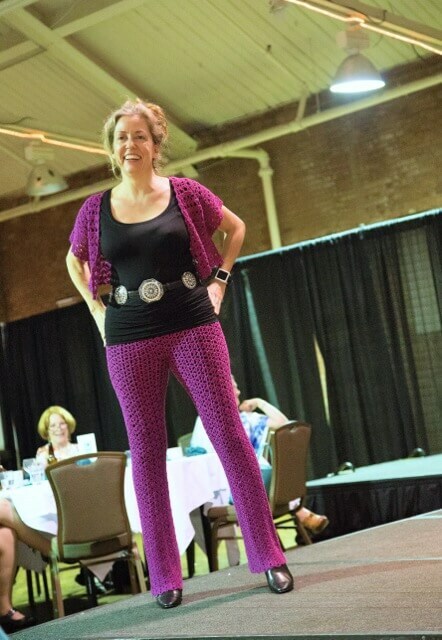 Here’s one Alex snapped at the 2014 summer fashion show banquet, during the guild’s 20th anniversary crochet conference. Doris Chan designed the lace pants and the bolero in her signature construction method of crocheting in the round from the top down. The drape and fit feel naturally comfortable and sleek. She waited to design these garments until we developed the Lotus yarn for them. They’re made for each other. Click on the photo for more details on the patterns. Bolero pattern and our Lotus yarn are in the shop. Even Alex and Irene’s adorable toddling daughter modeled on the runway for the first time! July 26, 2014 at the Radisson in Manchester, New Hampshire. It’s been over three years since I crocheted the original Mesmer design prototype and I’m as entranced by it as ever. The crocheting experience feels magical, and I still get a bit wonderstruck when I wrap myself with it. Click on each photo to enlarge it and see its story. The Mesmer Tunisian Crochet Veil pattern PDF is now in the DesigningVashti SHOP as an instant download. You can also find the pattern for it, and projects, in Ravelry. Mesmer is fun project because not only is it fast, it’s an unusual experience of Tunisian crochet and of yarn combining. It’s rare that the Return Pass has the starring role in a Tunisian crochet fabric; in fact, it’s more common for designers to downplay it, or try to work around it. One reason is that it has the least amount of stretch, like the foundation chain in regular crochet. Another reason is its texture doesn’t blend in readily, so it gives a strong texture. Although this design is a fun way to combine scrap yarns, I designed it to make fancy, pricy yarns last longer.